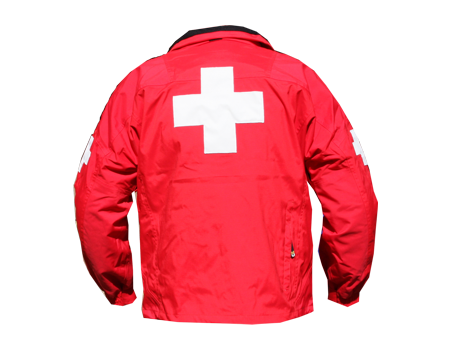 Fabric & Construction: Standard waterproof breathable membrane laminate, durable nylon. Abrasion-resistant fabrics in heavy wear areas. All seams double-stitched and taped (seam sealed). Functions: Available in Long and Mid Length. Functional panels to ensure comfortable fit and ease of use. Raglan sleeve cut. Design and accents provide a good look with functional features. Coordinate your image and continue it from year to year. 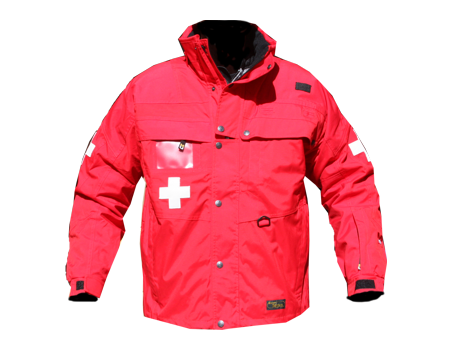 Jackets are standard with adjustable shock cord at waist and bottom for longer length. Mid-length options has shock cord at bottom. Optional snow/wind cuffs in sleeves and at waist. Soft brush, chin guard (optional). Extra-long front placket pocket that fits a clip board, or hat, etc. Zip-off or attached technical hood that tucks can into collar or stows in rear storage pocket. Other standard features include radio pocket, convenient fore-arm pocket, and other well-placed storage pockets. Ventilation zips under arms with mesh. Clear vinyl name-tag slot or badge tab attachment options. Your logo / patches embroidered and taped in production with large orders. Includes reflective crosses on right front chest, arms and back. Lining: Available with breathable brush Tricot body, 210T sleeves for warmth and movement. Group orders of 50 or more can order insulation (40-200 gram), with advance order in spring, for fall / winter delivery. Accessories / Layering: Matching Softshell, Fleece available in same colors and design. Look the same as others on your team no matter which layer is worn. Some “Standard” options available, for immediate purchase. Sizes: Available in sizes xs – 4XL, in long-length and mid-length. Colors: Standard in Red/Black, Red/Red. Comes with crosses. Same design is also available without crosses in red, black, navy, royal, tangerine. (Limited stock may be available – Check the MU Online Store, Patrol and Ops sections for availability) Choose your own color with advance orders of 50 or more – call for details. Ordering: Get this item at the MU Online Store now, or call to reserve larger quantities in advance.